...how freaking awesome is my Dawg sash?! I am rather proud considering it's only like the 3rd thing I've ever sewn. Can you tell I modeled it after J. Crew's sash that goes with the Lyndsey dress? Remember when they sold those sashes a la carte in a million different colors a few years ago? Yeah I have like all of them. And now I have a Dawg version! Woof woof! I never thought about making a sash thanks for the great tip. I think I will be making one if I cannot get my hands on one of the new Vineyard Vines collegiate collection ones! It came out great......good luck with the tickets!!!!!!! So cute! You'll definitely be the best dressed at the game! Have fun! OMG YOU made that??!! Sew proud of you! Love it! I want one- make me one please! I love it! I am inspired! 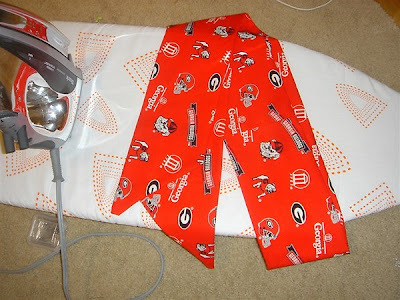 I bought some Auburn fabric yesterday (it's in the dryer as I type) and I'm gonna give it a try. Luckily, I also own a Lindsay dress to model it after. Did you use any lining or interfacing or just go for it with the fabric alone? Mockingbird... Nope - no special lining or anything. I'm VERY new to sewing, so this is about as basic as it gets! I just winged it and it came out great, so I'm sure anyone with a lick of sewing experience can whip this up easy.